The upcoming Plastics Extrusion World Expo will include a panel discussion on key issues surrounding the professional development of women in the plastics industry. The panel, Women in Plastics: Empowering Industry Change, will feature high-achieving women from across the world of plastics sharing their perspectives on breaking through in this traditionally male-dominated industry. Among the topics to explore, they will look at the different paths these leaders have taken into the plastics industry, how the modern workplace is becoming more inclusive, and future challenges and opportunities for the next generation of women. Organized by AMI, the Plastics Extrusion World Expo will take place at the Huntington Convention Center in Cleveland, Ohio, USA on May 8-9, 2019. 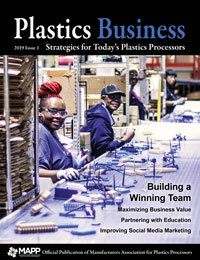 It is being held alongside the Compounding World Expo and the Plastics Recycling World Expo. By registering in advance, visitors will receive free admission to all three exhibitions, featuring more than 250 suppliers, plus free entry to five conference theaters hosting technical presentations, educational seminars and business debates. Attendees may also buy tickets for the networking party at Cleveland’s Rock and Roll Hall of Fame on the evening of May 8.